Steadily building up your skills day by day is invaluable to long-term growth, but sometimes you need a hefty dose of expert guidance to boost you to that next level. EMS Communications’ keynote speeches and webinars provide you and your company exactly that boost. Hosting a networking event or other large group gathering? Are you looking for a way to educate, entertain and motivate the crowd? Enrich your event by inviting a speaker from EMS to deliver an engaging and memorable keynote speech. EMS speakers will travel to the location of your choosing to deliver a 1-2 hour interactive event. 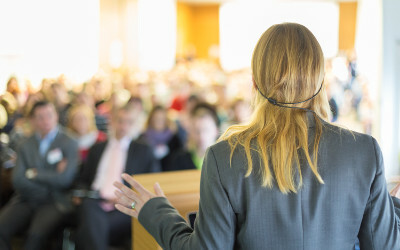 These presentations can cover a wide range of topics including public speaking, leadership, and interpersonal communication. The content is always customized to address the specific group in attendance, ensuring that the audience gets the maximum value for their time. Not every organization has the resources to make it practical to participate in on-site workshops, seminars, or coaching programs. In this case, EMS creates educational, web-based presentations that are accessible to your team wherever they’re located. Potential topics include The Fundamentals of Public Speaking, leadership, interpersonal communication, or even how to create an effective webinar or video conference, just like the one you’ll be watching!